Marrakech, Essaouira, Agadir, Fez … Ok, you know these cities! Morocco has become in recent years one of the most popular destinations of the French tourists to spend few days under the sun and get a change of air. So it may be time to take an interest in the near future … And to join the Moroccan jet set that is building up step by step its own “Riviera”, in the north of the country. Near the town of Tetouan, on a wide ribbon of sunny beaches and bordered by the Mediterranean Sea, it is here that the wealthy Moroccans following their monarch are found during the summer. King Mohammed VI, in fact, has built his summer palace on the shores of the small town of M’diq. Right next door opened, in April 2016, a Sofitel of high standing which has already become the rallying point of the wealthy Moroccan youth generation in the summer. We must say that the Sofitel Tamuda Bay does not lack charm. First good point, it is not another “palace with oriental luxury” but is resolutely modern. It is the result of the work by the architect Galal Mahmoud who married touches of modernized Moroccan architecture, such as the moucharabieh which covers the glass spaces, with decorations inspired by the great French painters like Matisse or Braque. The key signature of this Sofitel is the blue “dit Matisse” which is everywhere. Outside, an huge blue square is drawn between the white buildings. It is the royal suite around which the whole building is articulated. Inside, touches of blue here and there, a lobby bar that breaks the codes and which comes alive in the evening to the sound of a DJ. Spots of color everywhere, rattan furniture enhanced with beautiful fabrics, a tapas bar and a “show dining” restaurant where you can watch the kitchen team come alive. Not to mention a beautiful heated swimming pool that opens onto the beach, lounge huts between the palm trees and, further, “beach suites” to sleep feet in the water. Of course, there is a wonderful spa and even three “spa suites” in which fitness machine are arranged and where you can program private spa care throughout your stay. In short, a hotel full of color and resolutely oriented towards high-end service, the starting point for the development of this coast located opposite Spain and bathed by the Mediterranean Sea and its warm waters. You’re doubting the potential of this destination? In addition to this Sofitel, there is already a Banyan Tree and a Ritz Carlton as well as a Marriot are opening soon … So don’t hesitate to discover this little corner of Morocco still far away from crowds. 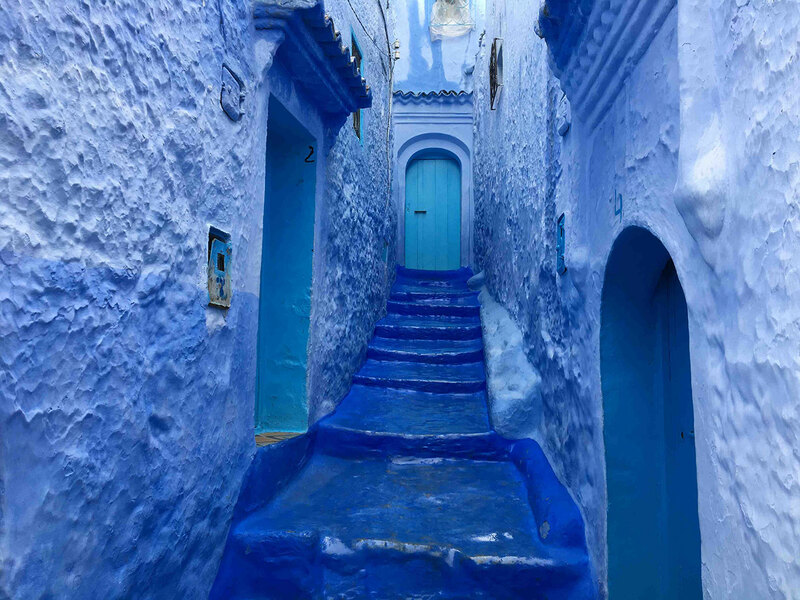 And venture out to visit the amazing blue town of Chefchaouen. The inhabitants of this little hamlet hung on the mountains, an hour’s drive from Tetouan, brush their houses with blue paint. The result is one of the most photogenic panoramas in the world. We love to get lost in its little indigo streets and watch life bustling nonchalantly. From Sofitel Tamuda Bay to Chefchaouen, blue Moroccan is definitely beaming at everywhere corner.